Alexander Ovechkin needed less than one period to regain his scoring touch the last time he played. 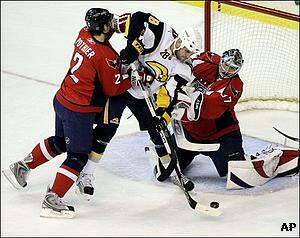 Now, he'll try to keep the Washington Capitals from a season series-sweep by the Buffalo Sabres. The league's top scorer looks to build off a milestone game when the Capitals (31-28-8) meet Ryan Miller and the Sabres on Wednesday night for the final time in the regular season. After being held to one goal in his previous eight games, Ovechkin scored three times in the first period - and passed the 50-goal plateau - in Washington's 10-2 rout of Boston on Monday. He also added two assists for his third five-point game this season. "(Monday), everything just went to the net," said Ovechkin, who leads the NHL with 52 goals and 90 points. "You are going to score (in) lots of games, and some you (won't). I always tell myself not to think about goals and to just play how I can." Ovechkin needs one goal for a new career high, and with eight more in his final 15 games, would be the first player with 60 in a season since Pittsburgh's Mario Lemieux (69) and Jaromir Jagr (62) in 1995-96. Ovechkin has one goal in each game against Buffalo this season, but the Caps have been outscored 15-7 in the three losses. In 11 career games versus the Sabres, the top overall pick in the 2004 draft has seven goals and five assists, yet Washington is just 2-9-0. Miller has won seven consecutive starts versus the Caps since his only career loss to them in October 2005. Washington's Cristobal Huet, acquired from Montreal at last Tuesday's trade deadline, made 20 saves against the Bruins. He was pulled in favor of Olaf Kolzig after two periods because of mild back spasms. Huet's status for Wednesday is unknown, but he is 6-5-3 with a 2.62 goals-against average in 15 career games against the Sabres (32-26-9). Kolzig, meanwhile, is 14-15-0 with two ties and a 2.60 GAA in 32 all-time meetings. The Capitals, who seek to return to the postseason for the first time since 2002-03, are in 11th place in the Eastern Conference - four points behind Philadelphia for the eighth and final playoff spot. "Just wait, we have lots of games left, and one game can mean nothing," Ovechkin said. "We just have to continue to do what we did today, and try to play the same way on Wednesday." Buffalo, though, pulled within one point of that same position following its 5-2 road victory against the Flyers on Tuesday. Maxim Afinogenov had two goals and an assist, while Jason Pominville also scored twice for the Sabres, who won for just the second time in six games. With a victory on Wednesday, the Sabres will move past the idle Flyers into eighth. "You look at it, they would be up by five points if we don't win this one and now we're one point behind them," said Pominville, who has six goals and five assists during his season-high, nine-game points streak. "I mean this is a big game and I'm definitely excited that we came up with two points but, again, tomorrow, we have another big test." Pominville, who leads the Sabres with 62 points, had two assists in a 5-3 win over the Capitals on Dec. 14. He's also scored goals in each of the other two games against them this season.